Samples in pristine 24 bit quality. 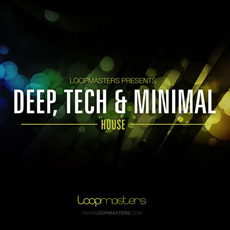 A consummate collection of some of the deepest loops for house music’s elite production specialists, featuring a wealth of previously unheard and unreleased material created exclusively for Loopmasters with modern house music producers solely in mind. Deep, Tech and Minimal House draws a sonic line between the Deep Tech sounds of Dennis Ferrer, Danism, Milton Jackson, Rocco, Shur-I-Khan and similar artists, and develops on the common elements and vibes that exists between both Deep, Tech and Minimal house styles. Tech house vibes influenced by artists such as Sebastien Ledger, Laidback Luke, Funkerman and Pryda, with Minimal vibes of Dubfire, EDX, Deadmau5. Essential sounds which create a multi tempo melting pot of edgy, dirty and twisted samples that not only captures the current sound of dance floors worldwide but provides inspirational sounds that we are sure will play its part in the future of these genres. Featuring over 1.2GB of the most up to date sounds and samples in pristine 24 bit quality. In detail, Deep, Tech and Minimal house includes 84 Subliminal Groove bass loops, more than 300 Club ready Drum loops, including tops, variations and percussion, 54 Glitched out and Tweaked Up Loops, 21 Lead Lines, 110 Blissed out and Jacked up Sequences and Chord patterns, 16 Full and Original Vocal Loops, 30 ready to program Bass Tones, 83 Spoken Vocal Phrases ready for your next club hook, and don’t forget after all of that you get an unprecedented 555 Drum Samples and One shots, created with Deep, Tech and Minimal House in mind. Throw into the mix 22 SFX samples perfect for breakdowns and minimal Mash ups, 40 Synth Stabs, and 6 White Noise samples - and you what we consider to be the most up to date and fully packed production kit around! If your music moves between Electro, Deep, Tech and Minimal House, and you are looking for the ultimate collection of sounds and samples to inspire your future productions and add serious dance floor pressure to your mix - check out the future of Deep, Tech and Minimal House today!